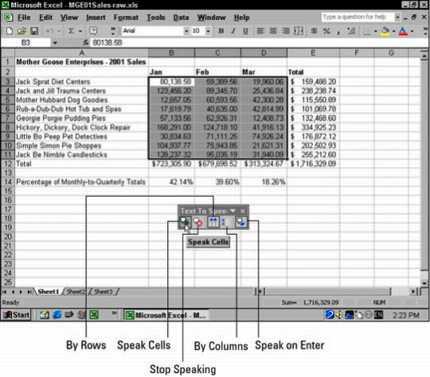 Excel 2002 is unique in the Office XP suite in its support of the new Text to Speech feature, which enables you to have your computer read back any series of cell entries. This feature is perfect for when you need to check the accuracy of a bunch of numbers that you enter from a printed source. By using Text to Speech, you can check your printed source as the computer reads out loud the values and labels that you’ve actually entered. This new feature provides a real nifty way to catch and correct errors that may otherwise escape unnoticed. 1. Select the cells in the worksheet that you want to convert to speech. 2. Choose Tools–>Speech–>Show Text to Speech Toolbar from the Excel menu bar to display the Text to Speech toolbar (shown in Figure 1). Figure 1: Check your entries with the Text to Speech feature. 3. Click the Speak Cells button in the Text to Speech toolbar (the first button, with the arrow pointing right) to have the computer begin reading back the entries in the selected cells. By default, the Text to Speech feature reads the contents of each cell in the current selection by first going across the rows and then down the columns. If you want Text to Speech to read down the columns and then across the rows, click the By Columns button on the toolbar (the fourth button, with the vertical arrow). 4. To have the Text to Speech feature read back each cell entry as you press the Enter key (at which point the cell pointer moves down to the next cell in the selection), click the Speech on Enter button (the last button on the toolbar, with the curved arrow Enter symbol). After selecting this option, you need to press Enter each time that you want to hear an entry read back to you. 5. To pause the Text to Speech feature when you’re not using the Speech on Enter option (Step 4) and you locate a discrepancy between what you’re reading and what you’re hearing, click the Stop Speaking button (the second button on the toolbar, with the X). 6. When you’re finished checking all the entries in the current cell selection, click the Close box (the one with the X) in the upper-right corner of the Text to Speech toolbar to close it. Note that unlike when using Excel’s Speech Recognition feature, the Text to Speech translation feature requires no prior training or special microphones. All that’s required is a pair of speakers or headphones connected to your computer. f you click the Speak on Enter button in the Text to Speech toolbar, the computer speaks each new cell entry that you make in a worksheet even after you close the Text to Speech toolbar. Just remember that you must complete the new cell entry by pressing the Enter key and not by some other method, such as clicking the Enter button on the formula bar or pressing the Down Arrow key in order to have the Text to Speech feature read what you just entered. By default, the Text to Speech feature selects the voice called LH Michelle, a somewhat mechanical but definitely female voice that suggests to me a female version of Stephen Hawking’s computer-generated voice (perhaps that of his girlfriend?). Stephen Hawking, in case you don’t know, is one of the most renowned theoretical physicists of our age (some regard him on par with Einstein). However, because of extreme physical disabilities, he’s been forced to use a computer-generated voice in order to communicate his wonderful ideas about the origins of the universe. 1. Choose Start–>Settings–>Control Panel from the taskbar. 2. From Control Panel, double-click the Speech icon. The Speech Properties dialog box opens. 3. From the Speech Properties dialog box, click the Text to Speech tab. Make your voice selection in this tab. Click the Voice Selection drop-down button and choose LH Michael from the pop-up menu. 4. To slow down or speed up the speed of this voice, drag the Voice Speed slider left (to slow the voice down) or right (to speed it up). To check the speed of the voice you choose, click the Preview Voice button, located immediately above the Voice Speed slider. Excel plays you a sample voice at the speed you set. 5. When you’re happy with the voice speed, click OK to close the Speech Properties dialog box. 6. Click the X in the upper-right corner of the Control Panel window to return to Excel.